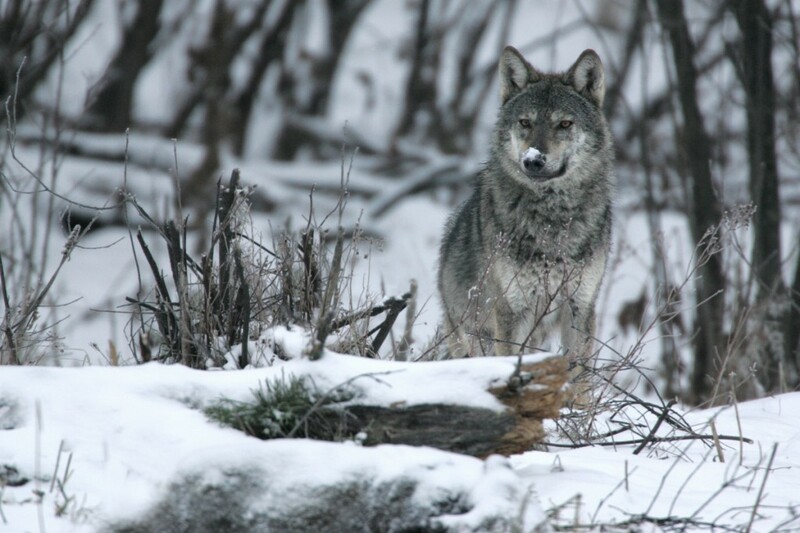 A regional wolf hunting ban was recently decided in eastern Slovakia, covering one of the rewilding areas: the Poloniny National Park and the Eastern Carpathians Landscape Park, also called the “Wolf Mountains”. This is the first positive step in the restoration and protection of the wolf population in the Carpathians. Wild Carpathian Wolf photographed in Bieszczady Mountains. The decision is a result of the very active work by our local partner WOLF, as well as by Czech and Polish NGO’s to raise the attention of the local authorities and the European Commission about the wolf situation. These organisations have been running a campaign calling to a halt of the widespread killing of wolves on the Slovak side of the region. 150 wolves were killed there during the last open hunting season in 2013 (even though the limit was 130), of which 1/3 were killed inside the rewilding area. In total, during the last ten years almost 1200 individuals of this protected carnivore species have been killed. In June, the European Commission started an investigation based on the request from Czech, Slovak and Polish environment NGOs and letters from more than a thousand citizens from these three countries, complaining to the EC about this situation. Apart from the legal hunting, also poaching as well as busy highways and railways prevent wolves from returning to their natural habitats. Several overpasses need to be constructed at the most frequent wildlife crossing points, in order to reduce the mortality rate. WOLF pointed out the discordance between the by the government earlier legalized wolf hunting and the European legislation. Similarly, the Czech and Polish organizations Hnutí DUHA and Pracownia na rzecz Wszytskich lstot drew the European Commission´s attention to this. The wolf is today fully protected in the neighbouring states: the Czech Republic, Poland and Hungary. Under the current directives of the European Union, agreed to by the member states of the EU, the wolf belongs to the ”Priority species”, which Europe is going to protect. The European Commission, in charge of surveillance of the law enforcement, has now started a special ”infringement” investigation of the Slovak Republic, in order to make it clear that these actions are against European law. Our partner WOLF also significantly contributed to preventing a suggested amendment to the Game Act, which would have reduced the areas of the hunting districts by about 10 times (this would have posed an extreme threat to both herbivores and large carnivores in the Wolf Mountains) and they also achieved a nation-wide ban on the selective trapping of large carnivores.